If you haven’t heard of the Italian region of South Tyrol, you’re not alone. Located at the northern border of Italy and also known as Alto Adige (Italian) and Südtirol (German), it offers breathtaking scenery, charming villages and a wide variety of activities for the whole family. The jewel in South Tyrol’s crown is the famed Dolomite Mountains, a UNESCO world heritage site since 2009. The local culture is a unique blend — it feels Italian, but there’s a distinct Germanic flavor in the mountain villages, as the area belonged to Austria until the end of WWI. Here are three of our favorite home bases for experiencing the region’s grandeur. The quaint and quiet alpine village of San Cassiano is home to a longtime CB! favorite: Hotel Rosa Alpina. This luxury boutique hotel offers gorgeous common areas and cozy rooms, all with an elegant yet comfortable style. A pleasant two-and-a-half-hour drive from Marco Polo Airport in Venice, it was the perfect place to begin our South Tyrolean adventure. San Cassiano has shops and restaurants, but the main draw is the outdoor activities. There’s world-class skiing in the winter and hiking, biking and other outdoor sports throughout the rest of the year. Any stay at Rosa Alpina must include a dinner at St. Hubertus, the hotel’s two-Michelin-star restaurant. Although well-behaved children are always welcome, dinner is a lengthy event; children might be happier back in the room with a private babysitter, which can be arranged through the concierge. Executive chef Norbert Niederkofler is a pioneer of the alpine cuisine movement, which focuses on seasonal, locally sourced ingredients. TIP: If you’re in San Cassiano on a rainy day and have a touch of cabin fever, check out Museum Ladin Ursus Ladinicus. This small museum shares the history of the Dolomites. Kids will love the cavelike exhibit that tells the story of the ancient cave bears found in this region 50,000 years ago. A one-hour scenic drive west of San Cassiano on the Brenner Motorway, through the Val Gardena Valley, leads to the lively village of Ortisei. The largest village in the valley, it’s full of alpine charm, from window boxes exploding with red geraniums to cobblestone streets. Ortisei is a very popular ski destination, with easy access to two nearby ski areas. A short bus ride to S. Cristina offers access to a lifetime’s worth of skiing. With the Dolomiti Superski Pass, you have access to twelve ski regions, 450 lifts, and 1,220 km of downhill slopes. The heart of Ortisei is a delightful pedestrian district with shops and restaurants. It is also home to Cavallino Bianco, an all-inclusive, families-only resort. It’s a magical place where kids reign and the list of family-friendly amenities seems almost endless … playgrounds, kids’ clubs, kids’ pools, special excursions, the works! Val Gardena is home to the famous Sella Ronda, the world’s largest “ski carousel.” The Sella Ronda is a circular ski path that takes you on a 40-km tour through the Dolomites. The 26 km of downhill runs are accessible for all levels of skiers, and there are plenty of huts along the way for breaks and warm drinks. It’s possible to complete the tour in one day if you get an early start. TIP: Troy Haines, founder of Alpinehikers, spent several weeks in Ortisei with his young children. He recommends Mar Dolomit, a local public pool complex with baby pools, splash pads, a waterslide and a fun lazy river that’s anything but lazy. It’s fast and intense, Troy says, and his kids love it. A short gondola ride over the mountain from Ortisei drops visitors on the Alpe di Siusi, the largest alpine meadow in Europe. Roughly the size of 8,000 soccer pitches, it offers year-round activities for outdoor enthusiasts. Spring and summer are perfect for hiking, mountain biking, paragliding, horseback riding or simply enjoying the alpine wildflowers. Downhill and cross-country skiing, snowboarding, sledding and snowshoeing are popular in the winter months. We loved hiking with our guide Martha from the Südtirol Tourism Board. This region has many myths and legends; each summer, Martha — dressed as the Good Witch Martha in traditional garb — takes families on guided walking tours of the Alpe di Siusi. She shares stories of witches, sprites and other wild folk, and how they relate to the local history and geography. Martha is also an enthusiastic botanist and can name all of the wildflowers and trees. We found her tour entertaining and educational. Between activities, make time to enjoy a meal at one of the area’s many mountain huts. Our lunch at Gostner Schwaige was a highlight of our trip. Chef Franz Mulser creates fresh interpretations of regional favorites. Most ingredients are sourced from his family’s farm and garden. The artisanal meats and cheeses are from local farms as well. There is a charming but small dining area in the traditional stube style inside, but it’s best to grab a table outside to take in the views and keep an eye on the kids as they enjoy the nearby playground, zip line and pygmy goats. Don’t miss the kaiserschmarrn, with plums and rose petals. Franz prepares this traditional dessert tableside on a wood-burning stove. It’s entertaining and delicious! After a fun day exploring the Alpe di Siusi, you can return to Ortesei on the gondola or stay and enjoy the solitude at the luxurious Alpina Dolomites. This five-star wellness hotel is a modern interpretation of an alpine ski lodge. The views are dramatic and the remote location is peaceful and serene. The Alpina Dolomites has amenities for families, including a mini-club, family sauna, family suites, and a ski school just steps away. Parents will enjoy the world-class spa with a large menu of services and a variety of saunas. The indoor/outdoor pool is the perfect place to relax after a day of hiking or skiing. Afterward, watch the sun set on the Dolomites from your balcony, with the sound of cowbells pealing through the quiet. The contrast between the rose-colored illuminated stone and the shaded meadow and forest below is spectacular. 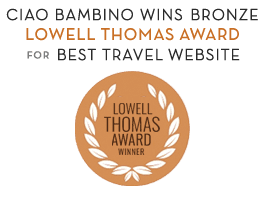 Editor’s Note: Ciao Bambino was hosted by the Sudtirol Tourism Board. As always, our opinions are our own. Photos by Denise Smith except where noted.